Artists have engaged the changing landscape at Freshkills for decades. 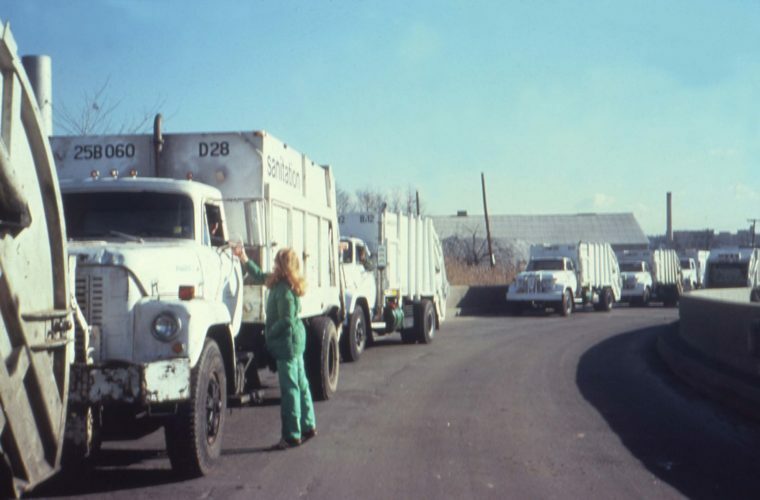 The Department of Sanitation Artist-in-Residence, Mierle Laderman Ukeles, will discuss her pioneering 30+ year residency with the city agency and the evolving landfill-to-landscape at Freshkills with Mariel Villere (Freshkills Park Manager for Programs, Arts and Grants). This talk will take place at the Staten Island Arts’ Culture Lounge Gallery alongside the Freshkills Park: Landscape in Motion exhibit, on display from September 22-November 26, 2016. Ukeles’ projects have ranged from socially-engaged and performance-based works with Sanitation workers, to choreographed machine performances, to monumental environmental art at this landscape, all made possible by time and behind-the-scenes access. Today, while the site is being built incrementally over time, Mariel Villere organizes monthly photography tours in a series called “Capturing Change,” which has become a durational record of the site’s transformation, likewise emphasizing the importance of time for artists making work at and about the landscape as it evolves. The first survey of Ukeles’ work, “Mierle Laderman Ukeles: Maintenance Art,” is organized by Queens Museum’s Larissa Harris and guest co-curator Patricia C. Phillips. The show will span five decades, from her work as a pioneer of feminist performance to a practitioner of “new genre public art,” in which Ukeles invites us to reconsider indispensable urban systems and the workers who maintain them. The exhibit will be open at the Queens Museum from September 18, 2016-February 19, 2017 with associated public programming.